Many years ago, in 1970 to be more precise, the Scandinavian Open Championships (SOC) were held in the Halmstad Sporthall, or rather, “Spooathallen”, as it is referred to by a true Halmstad native. It was a big deal for the city; this applied to China as well, who participated in an international event for the first time since the start of the Cultural Revolution. The players were very excited when Olof Palme, then Swedish Prime Minister, visited Halmstad Sporthall to watch world class table tennis. Politics mattered a great deal even back then. It was also a big thing for the toddler who had come to the event, dragging his brother with him; he was granted an amazing and unforgettable experience when from close range he could watch all the world stars who had descended upon little Halmstad. Things weren’t exactly made worse when he, together with his brother, appeared on television when the camera zoomed in on the two young lads. 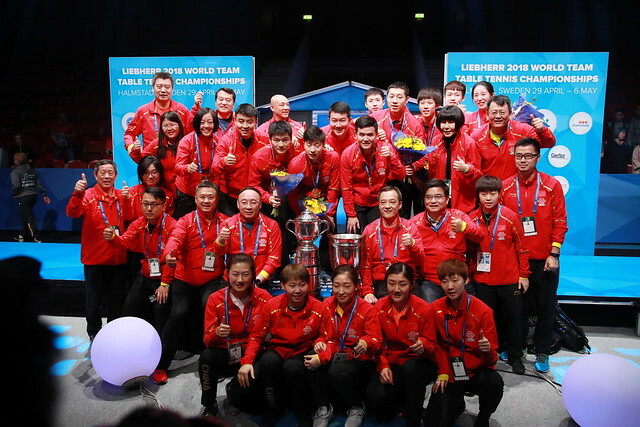 Now 48 years later, the time has come once again for a world table tennis event in Halmstad. The Liebherr World Team Championships is less than 40 days away, when the eyes of the world will once again turn to the county town of Halland. At a World Championships, illustrious titles and trophies are at stake. The host city is also be honoured with a trophy and this is not just any trophy. It’s named the Egypt Cup and is made from the finest silver. It was bestowed upon the sport of table tennis in 1939 by Egypt’s King Farouk, when the World Championships were played in Cairo. It was decided there and then that the trophy would be given each year to the host city to symbolize the friendship that characterizes the Championships; since then, it has basically been all over the world. Recently the Egypt Cup has arrived in Halmstad; it was quite understandably a bit chipped. The organiser therefore decided to summon a real expert, Håkan Ramsén, a very skilled goldsmith with great experience of restoring treasures of many kinds. Educated in both Copenhagen and London in gemology, the science of gemstones, he was undoubtedly the man for the job. And he didn’t hesitate for a second. “This is an honour I couldn’t turn down. Think of all the people who’ve put in so much work in to the insignias of this trophy. It has truly been a challenge to mend it, mostly because the cost of materials were much higher back in the days, which is why it has been mended relatively sparsely. Burdened by tradition like a few other trophies, the Egypt Cup actually has more contemporary relevance than many might suspect. For a very long time, the Egyptians were far ahead of us in the development of their craftsmanship. As a matter of fact, many of the tools they used thousands of years ago don’t differ that much from the ones I use today, which is quite extraordinary when you think about it.” Håkan Ramsén. If it is a dream for Halmstad to host a World Championship, working with a World Championshiptrophy is a dream for a goldsmith like Håkan Ramsén. Now he’s done it. On Thursday, their roads diverge, although he will be on site at Halmstad Arena to make sure that his masterpiece is well treated before it heads off on another journey. Next stop is Budapest, Hungary, which will be hosting the 2019 World Championships. Whatever happened to the toddler who, 48 years ago, was so stricken by the 1970 edition of SOC in Halmstad? Well, he grew up to become a goldsmith, and his name – Håkan Ramsén.